The property Siegfriedgasse 17, 1210 Vienna, is a residential building with 20 apartments and an underground garage. The apartment sizes vary between 50m² and 85m²; each having an outdoor area such as a balcony/terrace/loggia and the ground floor apartment with garden. In the basement, an underground parking area with 11 parking slots are also available. 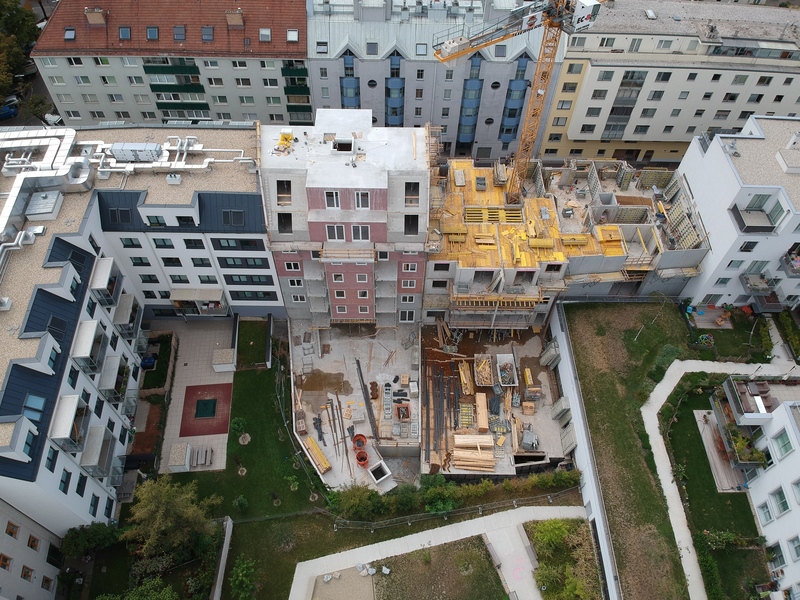 The implementations are according to the Austrian norms and is applicable to the current building standards along with the legal regulations and the recognized rules of technology. The building was built with Ziegelit; precast elements with crushed stones. In addition, the apartment also provides rooms for stroller storeroom, bicycle storeroom and a garbage room. The floors are made of natural oak parquet and the bathrooms are surfaced with high-quality stoneware. Thermal insulation windows with plastic framework and triple glazing were being used. All windows are equipped with inside blinds. The front doors from the street and to the courtyard have powder-coated aluminum frames with shatterproof glass. They are also integrated into the house-locking-system and can be used with apartment keys. The elevator, with handicapped accessible entrance, is operated from the basement into the top floor and is equipped with an emergency call system. For each apartment an assigned storage compartment in the basement has been provided. An intensive green area is being established above the underground parking area and is being covered with shrubs and bushes. The other part of the yard that has no underground level, is suitable for tree planting. From the staircase, one can enter the playground through a concrete pavement. The playground has a sandbox with planed larch wood. The kids playground is covered with impact protection plates. Next to the playground, an area with seating areas is being provided. The ground floor apartment Top 1 has a terrace and a private garden with shrub plantations, functioning as a visual protection from the rest of the public area.